Konstantin Apollonovich Savitsky (1844-1905) was born in the city of Taganrog in the village Frankovka or Baronovka, named after former Mayor Baron Otto Frank. Today this area is occupied by Taganrog Iron and Steel Factory (TAGMET). Savitsky's family lived in the building of Taganrog Boys Gymnasium, where his father worked as a doctor. In Frankovka the family rented a summer house. Savitsky spent his childhood and youth in Taganrog. He showed an interest for painting in the early childhood. Being on the shore of Azov Sea with his parents, he loved to make sketches, and drawing lessons at Gymnasium were his favourite subject. When Konstantin was fifth-grader at Taganrog Gymnasium, his teenager's life changed unexpectedly. Both of his parents died suddenly. Kostya was taken by his uncle who lived in present-day Latvia and became his guardian. There Savitsky entered a private boarding-school and in 1862 he graduated and left for Saint Petersburg, where entered The Imperial Academy of Arts in Saint Petersburg. Personal contacts with outstanding representatives of Russian culture - Ilya Repin, Ivan Shishkin, Viktor Vasnetsov, Mark Antokolski, Stasov, Nikolai Mikhailovich Karamzin - made a great influence on development of the young artist. Soon Savitsky became one of the best students of the Imperial Academy of Arts. His student paintings were awarded with silver medals and for his painting "Cain and Abel"(1871) he received a gold medal. After graduation from Imperial Academy of Arts and two years abroad, the artist becomes co-partner of mobile art exhibitions (Peredvizhniki, a group of Russian realist artists who in protest to academic restrictions formed an artists' cooperative, which evolved into the Society for Traveling Art Exhibitions in 1870. 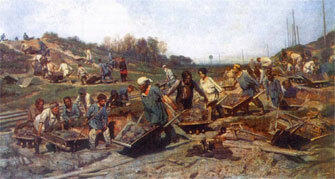 The artwork "Repairing Railroad" was one of the first paintings of that time dedicated to life of the working class. Konstantin Savitsky is a co-author of the famous painting Morning in the Pine Forest. On the original Peredvizhniki exhibition the painting was shown by two authors Ivan Shishkin and Konstantin Savitsky. 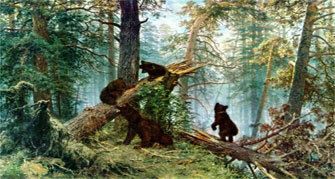 It was assumed that Savitsky had painted the bears and Shishkin the forest but later the scholars found that preparational drawing of the pine forest were made by both Savitsky and Shishkin. Later Savitsky withdrew his signature from the painting and it is currently exponated as a sole Shishkin's work. The titles of his artworks as "Lost all their possessions in the fire", "To war", "Herdsmen", "Krutchnik", "Argument at the Bound" speak about the direction of his art. After graduation from Imperial Academy of Arts the artist dedicated more than 20 years to teaching arts in the art schools of Moscow, Saint Petersburg and Penza. In 1897 Konstantin Savitsky became member of the Imperial Academy of Arts. There are two works of Savitsky in the Taganrog Museum of Art. One of them called "Father" was personally presented by Savitsky to the museum of his homecity.